Muhammad Busyaeri Jafar is better known in Gorontalo as Brother Erick. He’s become widely known by a name in his second language, but six years ago, he wasn’t sure anybody would know him at all. After Muhammad graduated university in 2011, he moved to his wife’s home in Gorontalo on the northernmost leg of Sulawesi. His degree in law was of surprisingly little use and he needed to find a job quick. At the time, Gorontalo was a 10-year-old province, having become independent from North Sulawesi. Developments were springing up in the city, but unemployment was high and jobs scarce. Muhammad had kickstarted a career in English with a scholarship to study in an American high school. Then during college, he leveraged English to pay his way through university. By the end of his four years, he was charging a high price of Rp300k (roughly $30) per lesson and had organized a week-long English camp. Although he had wanted to be an ambassador, he told me that English was his best bet for finding work – or in his case, creating work. He wanted to set up a private school for English, but the only rented space he could find cost far more than the money he had. A classroom in My Liberty. So he made a deal with the landlord. He paid a fifth of the monthly price as a down payment, and if he could not find the rest of the money by the next month, he would leave. The space was a single a classroom the size and extravagance of a bachelor pad, and he had a 30 days to set up stable income. Muhammad waited outside schools at opening and closing. He spoke with headmasters to persuade them to tell their students about the business. He tried convincing university students of the benefits of English. With the support of his wife, a notary, he found 127 students in a month – more than enough to pay rent. Now, Erick’s school, My Liberty, sits in prime real estate next to the only mall in the city. Using the title Brother and Sister over Mister and Miss is one of the ways Erick tries to make his business unique. After two months, students have to pay Rp1,000 ($0.08) for every word spoken that is not English. Some of the phrases the instructors teach are so unique that I can identify them in the villages outside the city, even from students who haven’t attended his school. 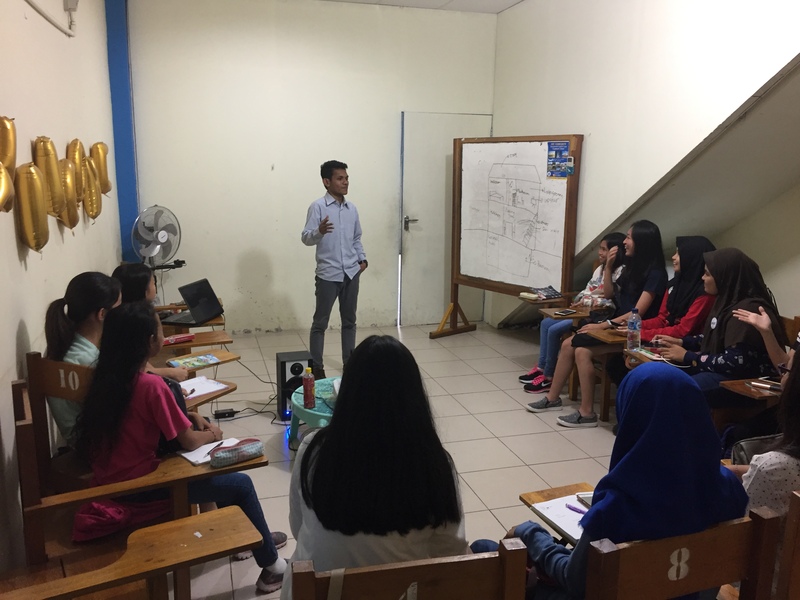 Erick boasts almost 50,000 alumni of his teaching and business in Sulawesi. One of them is Agus Kamba, who left his work driving bentors – taxi-motorbikes like rickshaws – behind after learning English. I wanted to hear more, and luckily Agus was not hard to find. Using his English, he set up partnerships with hotels. On a free afternoon, I visited one, asked around for him, but he had long since moved on. Fortunately, one of the people I spoke to still had his number. I gave him a ring and met him an hour later. When Agus graduated high school, he didn’t have enough money for university, so he joined the army. After he finished, he only found work with his bentor. Already married and with one child, Agus barely made minimum wage, valued in 2011 at roughly $90 each month. He used to wait for tourists by the ferry to Togean. The islands are some of the most popular tourist attractions in this region powered by fishing, although so few tourists visit Gorontalo that the Indonesian government does not bother collecting statistics on it. Yet Agus saw that drivers who knew English could had an advantage. “I had a friend who spoke English very well, and he said to me, ‘Agus, you must learn English,’” he said. So, without telling his wife, he searched for a place to learn English. He wanted to surprise her. That same year Erick had opened My Liberty, and Agus found him. 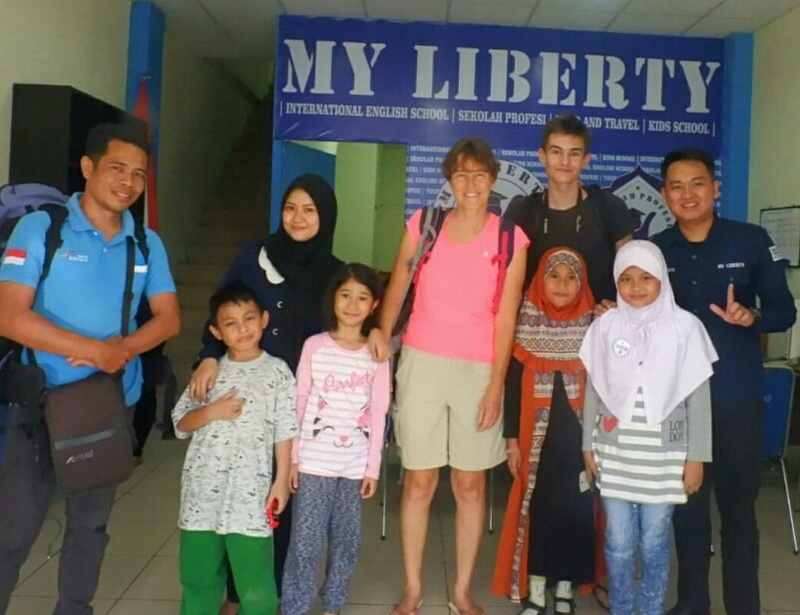 Agus had moved from the hotel I visited to manage an association of tour guides in Gorontalo. Gorontalo Tourist Guide is a partnership that intends to streamline communication between tourists, tour guides, and hotels. He doesn’t have to worry about breaking minimum wage now. When we met not far from his office – his wife and son sitting with him – Agus told me he had only studied English twice a week for two and a half months. But with the high price at My Liberty, it was only possible with a generous discount from Erick: two free months. My Liberty’s costs per month put lessons out of reach for many people. Jokowi recently called Gorontalo one of the poorest regions in the country. Erick acknowledges that mostly richer students enroll, but he still intends to increase prices at least 40 percent. When I asked him if he thinks that will cut off more students, he agreed but said the extra money will go towards quality and computers in every classroom. In addition, he said the instructors may increase community service in poorer schools, so perhaps there can still be stories like Agus’s.